The Roma are a nomadic ethnic group originating from the northern regions of India. 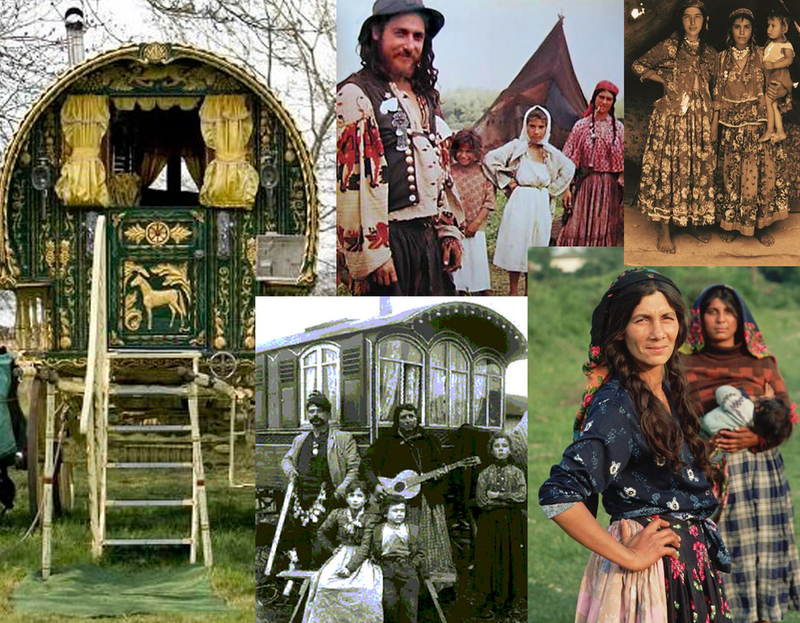 The Romani are known among English speaking people as "Gypsies". Around 1000 years ago they left Northern India and arrived in Mid-West Asia, then Europe. Romani are dispersed, with a concentrated population in Europe, specially Central, Eastern, and Southern Europe. When the Romani began their migration, they weren't welcomed by people in other countries because they looked and spoke differently, and they were often harassed or even physically harmed. This contributed to the development of their wandering style. Family has a high value for the traditional Romani, they have a strong community focus. Whenever there is a major event, such as a wedding or funeral, family members from all over gather. Also, as a matter of survival, the Romani were continuously on the move. They developed a reputation for a nomadic lifestyle. Romani music plays an important role in Central and Eastern European countries. Over the centuries, they tended to work at occupations they could perform independently, that appealed to people everywhere and that were not affected by their travels. The Roma have a long history working as metal smiths, in woodworking, carpentry and horse trading. During the Romanian Design week Mesteshukar Butiq was celebrating the collaboration of Romanian Designers with Roma handicraftsmen. Mesteshukar Butiq is a network of social economy enterprises and an active support of Roma traditional crafts. They managed to bring a fresh vision on Roma crafts and revive traditional products and objects with contemporary design. The lamp Autumn Leaf designed by Kaptura de Aer for Unity Manufacture (the brand for custom design of MBQMobil, one of the social enterprises from Mesteshukar group) is a perfect combination of Roma handicraftsmen and Romanian designer. Autumn Leaf was selected for design fairs out of Romania, the lamp won prices during the Balkan Design Fair and will be presented later this year in Istanbul and Vienna. Until a few decades ago the majority of Roma coppersmiths were traveling around. The tradition was passed on from generation to generation. Nowadays most of them are forced to give up their traditional profession, industrially produced mass goods have substituted the significantly more expensive craft goods. Previously, the coppersmith fulfilled an important function in the economic life of the villages. People were relying on the Roma passing several times a year in order to repair their pots and to make cauldrons. It was their main work to repair the cauldrons full of holes, to double the used floors and to cover the inside of the pots with tins. The cauldrons were used for cooking but also as distillery devices of the production of spirits. Making a simple bowl, plate or spoon takes hours. In order not to spoil the expensive raw materials, the smiths would not make any mistake. In contrast to warm smiths the copper plates can be brought, formed, to the right form in the course of a cold procedure by using special chasing hammers thanks to the elasticity of the metal. Spoon makers, woodworking is another skill the Roma people manage very well. It could be easily done when they were on the road, and the women were selling it to the people in the village were they were passing. Every household in Romania has a collection of wooden spoons. You can't compare them with what you can by in the stores these days. The woodwork done by the Roma have character, you can see every cut, you can feel the structure of the wood, it is a piece direct from nature. The basket weaving trade features among the oldest, widest-spread and most respected Roma professions. It fits the Roma in so far as Nature offers the raw material, free of cost and everywhere. Up to the middle of the last century, whole settlements could earn their living as basket makers. The women exchanged the baskets, which were made by the men, against goods which could then be traded on the market. 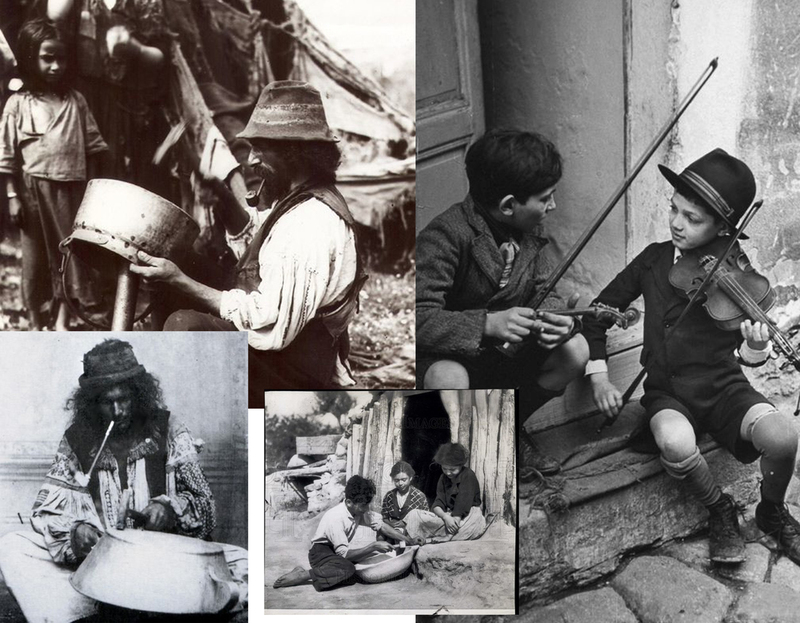 Their skill was respected, and all social levels had to rely on the services of the Roma. There was no alternative to woven baskets, which were mainly used for storage and transportation of food or even to carry heavy things, such as wood, metal or stones. Like for all traditional Roma professions, the significance of basket making has decreased continually over the last century. Nowadays, only a few Roma work as basket weavers. 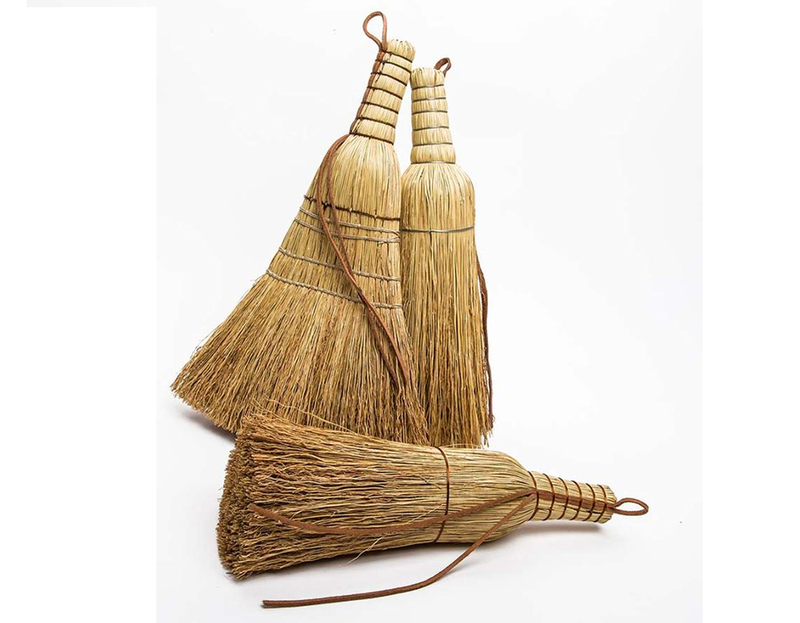 Traditionally the broom was used as a tool of spiritual cleansing and protection in folk magic. The broom has become an icon of the witch, as well as the symbol of cleaning itself. 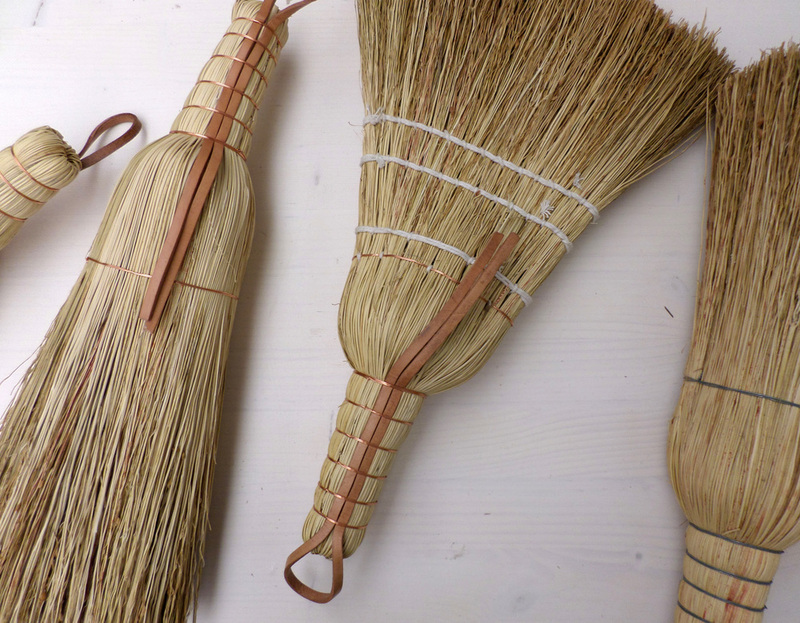 What can be nicer to clean with as a broom created with a lot of attention for details, such as the leather strip. Designers are getting inspired by the traditional Romanian garments as well as by the colourful Roma outfits. Typically, Roma women love opulence. The Roma women looked more outstanding with their necklaces made of gold coins and brights skirts. But men's costume was not less perfect: both beautiful and comfortable. One more way to show prosperity was decoration on jacket and waistcoat. In day-to-day life Roma women wear jewellery and headdresses decorated with coins, as a display of prosperity towards others. With the help of very simple means, creativity and great skill, items for everyday use were manufactured by the Roma since centuries. The tools had to be simple and easy to transport because the Roma were always prepared for traveling. Particularly the rural population often had to rely on the services of the Roma, because they didn't had the opportunity to visit the urban markets. These days we are overwhelmed by the products in the shops. Industrial manufactured goods, mass consumption, make every handcrafted good even more precious. Don't worry if you missed seeing Mesteshukar Butiq during the Romanian Design Week, the shop is in the center of Bucharest, Strada Edgar Quinet, nr. 7 or visit their mbq.ro . Take a look and fall in love with those amazing pieces of handcrafts work.